Released today by Statistics NZ an article discussing "The Kiwi factor in record net migration." At the 2008 election (which I stood in as an ACT candidate so remember the issues well) it was all hand-wringing over our young people leaving to live overseas. The brain-drain even. Now they aren't leaving, pushing up net migration, it's all hand-wringing over housing prices and job poaching due to high net migration. There is no happy medium. Because the oppositional style of politics, aided and abetted by media, will always find a crisis. Nice news on Sunday last. My entry into the annual Muriel Hopper Art Award, "Denise", received one of two People's Choice Awards. I also won one in 2014 for "Azalea"
“Sole Parents spend on average 14 years on a benefit, but we know that tertiary education can significantly reduce the average time they spend on welfare so we’re making it as easy as possible for them to transition to study. We knew a decrease in accommodation assistance was a disincentive for sole parents to move off a benefit and into study. This policy removes that barrier to higher education, encouraging more parents to take steps towards sustainable and rewarding employment. “On average beneficiaries with a tertiary qualification spend six and a half years less on a benefit compared to those without, so supporting them into full time study is a good investment in their futures, and their children’s future,” Mrs Tolley says. Using 14 years dependent on welfare as the bench mark makes it possible to sell this move as an 'investment'. But why not use NO time on a benefit as the ideal rather than seven and a half years? Why not set policy that encourages people to complete their education before having children? For DPB clients, most Work and Income interventions used appear to have little effect; training interventions are a particular weakness. Fifty-one percent of DPB recipients participating in an intervention took the Training Incentive Allowance, which MSD found to have no effect on the time a beneficiary was likely to spend off benefit – in fact the study found there was a chance TIA slightly increased the average time spent on benefit. MSD did note there was a chance that TIA may have an unobserved long-term impact (after seven years) on time spent off benefit. Essentially policy creates single parents then more policy is required to ensure they stay dependent for only seven and a half years. We're going backwards. OPINION: Why are so many children born into benefit-dependent families? "Much of the country is focused on child abuse, poverty, and putting kids' needs first. The political left tell us the Government should just spend a few dollars more, as they have told us for decades. Yet the current Government taxes and spends $80 billion every year. This surpasses the wildest dreams of the welfare state's architects. When Michael Joseph Savage departed office, government spent, in today's money, only about $2700 per person per year. Now it's $17,000 per person (or $85,000 per family of five). Just 2 per cent of working-age New Zealanders received benefits in the decades following Savage's reforms. Now it's 10 per cent, and welfare spending is the biggest item of government expenditure. So how can we still have child poverty and neglect in New Zealand? Lindsay Mitchell has made ending poverty her passion. She studies it meticulously and presents her conclusions politely and respectfully. The most staggering statistic she's given lately is that one in five children are born into benefit-dependent households. You might think that if you're on a benefit it's a bad time to bring a child into the world. You're probably like the overwhelming majority of New Zealanders who think it proper to wait, save and sacrifice before having children, in a comfortable environment, then stop when you feel your family is at a size you can support. Chances are you don't begrudge taxpayer support for people who fall on hard times, need to escape an abusive partner, or have any of a dozen other circumstances. But here is the interesting thing: being on a benefit seems to make you more likely to have children. Only 10 per cent of working-age people are on a benefit, yet 20 per cent of children are born into families receiving benefits. In the six months to March 2015, 6000 babies were added to existing benefits. That's enough to raise the hackles of those paying tax while preparing to have their own family, but worse is the outcomes for the kids involved. Benefits seem to make people have kids early, a key risk factor for maltreatment. As of 2015, in the general population 22 per cent of births were to mothers 24 or younger, but 44 per cent of beneficiary caregivers (mostly mothers but sometimes fathers) with a child born that year were 24 or younger. The ultimate result has been calamity for New Zealand kids. University of Auckland researchers have found that, of under-fives who faced maltreatment, 83 per cent were on benefits before age two. Out of fairness to the taxpayer and the children, we need a new deal. It's simply not good enough that the Government taxes some people, who are often waiting, saving, and sacrificing for parenthood, so that it can pay others to have kids earlier. It's absolutely unacceptable when we know this policy is enlarging child poverty and abuse. We need to put children first. If you're 18 or younger, you can't get an all-cash benefit from the Government. Instead it pays rent, power, and basic necessities before giving the remaining entitlement in cash. A compassionate government should attack child poverty by extending Income management to any parent who has additional children while on a benefit. The message would be simple. If you want to have children while receiving a benefit that's fine, but the Government will give entitlements in a form that puts the needs of the children first." "You're right, David. A lot has changed since Savage's day. 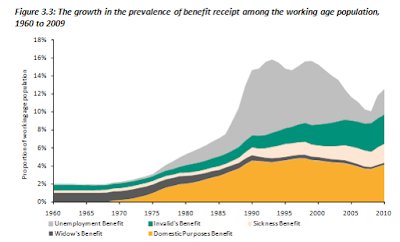 But it's not quite right to claim that in the decades following his reforms, that very few received benefits. From 1946, every family received Government support. It was called the Universal Family Benefit, and it went to every mother who had children under the age of 16. That made them part of the welfare state, but no one was vilified for that. Back then we also had low unemployment, generous state housing, high home ownership rates, and a 40-hour week that delivered wages you could live on. In contrast, we now spend billions of our welfare budget topping up working people's low wages and high rents – this is where the fastest growth in our welfare spending has been. In contrast, the number of people on sole parent support for instance, has remained static for years and represents just over 2 per cent of the working age population. Yes, there will be a small, tiny minority of people who make bad calls and it impacts on their children, whether they are on government support or not. And yes, we should have the tools in place to deal with that (just like we should have the tools in place to deal with people who avoid paying their taxes) But if we want to look at what has really changed since Savage, it's the fact our welfare state is having to pick up everything that is broken – ridiculous housing costs, low wages, people working multiple jobs to put food on the table and barely see their children, an education system that leaves too many behind, and a generation of kids who have lost hope. If you want to genuinely help turn the bus around, start with that list. I'm sure Savage would." Instead of the Universal Family Benefit there's now Working For Families which targets those families on lower incomes. National tightened the targeting. So Labour's response is to stop targeting low-income families? And people who get WFF are not vilified for it either, by the way. Back when there was "low unemployment, high home ownership rates, generous state housing and a 40-hour week that delivered wages you could live on" we had preferential tax rates for family men, wages set by the Arbitration Court, unproductive jobs and lots of horrible stuff that went with a highly regulated economy. So Labour's response is to re-regulate the economy? Undo their late 1980s work? The "fastest growth in welfare has been on topping up working people's low wages and high rents". Really? That'd be the accommodation supplement and WFF. When you create a policy and go from zero spending to over $2 billion of course it's going to show the fastest growth. So Labour's response is to get rid of its own policies? What she claims is anyway only true over a short period. The growth Seymour refers to has come because NZ went from having around 2% of its working age population on welfare for many decades (most commonly the Widow's Benefit) to 10% today (and it's been higher). Let's look at the next claim, "..the number of people on sole parent support for instance, has remained static for years and represents just over 2 per cent of the working age population." Static at 4% actually (see above). It has now dropped to 2.4% due to National's welfare reforms that concentrated on getting sole parents into work but also moved them onto other benefits. The fact is at the 2013 census 28 percent of families with dependent children were sole parent and just over three quarters received a benefit. So Labour's response is to sweep these numbers under the carpet? According to Ardern, who is all-knowing, a "small, tiny minority of people make bad calls". But one in five children born onto welfare does not represent a tiny minority. Which implies most of the decisions to have children who will immediately be plunged into 'child poverty' are good ones. And her piece wouldn't have been complete without the requisite pop at tax evaders. You see, rampant welfare isn't the problem. It's the people who question why they are paying their taxes for it who really need to be chastised and controlled. Ardern is a nice person who is very big on sympathy but, like the party she represents, woefully short on solutions.